"I leaned back, and then that shark, he came and he bit down on my arm and pulled me under." Katarina Zarutskie is a 19-year-old college student who has been modeling since she was 14. She also blogs and shares travel and lifestyle tips on her Instagram, where she has over 13,000 followers. Zarutskie, who is studying international business and nursing at the University of Miami, told BuzzFeed News her Instagram account grew pretty organically. "I love to travel and I've been blessed with many opportunities," she said. About a month ago, Zarutskie went to the Bahamas with her boyfriend and his family. She got some amazing shots. One day on the trip, Zarutskie was walking back from lunch when she happened upon a spot where nurse sharks were swimming. She said she saw multiple people swimming around in the pool with the sharks and wanted to get a photo with them. "Nurse sharks are calm creatures," she said, adding she had seen Instagram photos of people swimming next to the animals "so many times before." 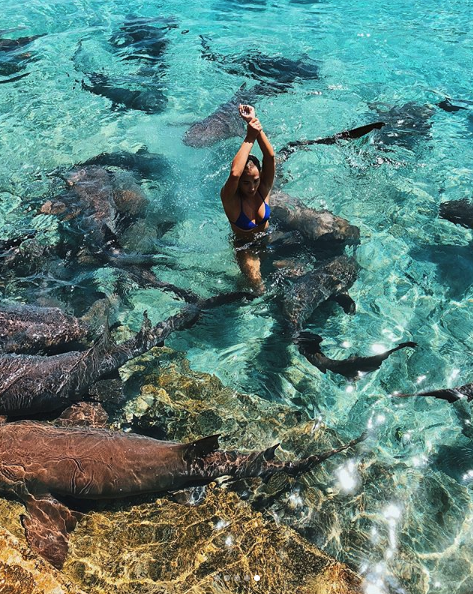 Swimming with nurse sharks in the Bahamas is a common activity, and they usually are "harmless to humans," according to Exuma Online. The tourist website promoting the Bahamas' Exuma district touts the swim as a "once in a lifetime adventure!" 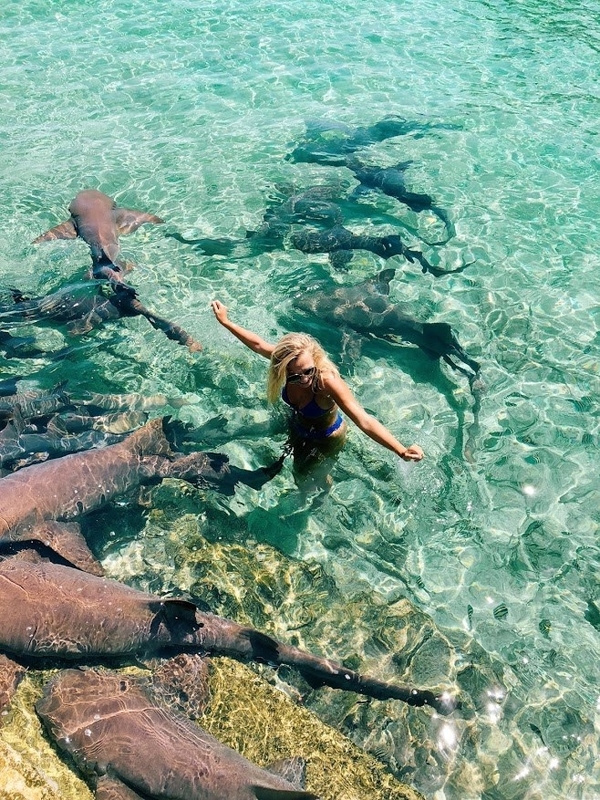 "Compass Cay, which is in the northern Euxma chain, is a popular destination for tour boat operators that allows guests to swim with and feed nurse sharks," the official Bahamas tourism website said. Even though her boyfriend's family was a bit skeptical, Zarutskie couldn't pass up the opportunity for this once-in-a-lifetime swim. So, she went in. “I leaned back, and then that shark he came and he bit down on my arm and pulled me under," she said. She said she was scared but knew she couldn't flail about if she wanted to make it out safely. When she got out of the water, she was very thankful when she saw that the shark had just bitten her on the arm. "I am lucky to have my hand," she said. Zarutskie knows she is "very, very blessed and fortunate" the situation was not worse. "It was a testament to how calm I stayed," she said. In the month since, Zarutskie has been recovering from the bite. She said she had to take multiple antibiotics because of the bacteria the shark may have carried. Zarutskie posted about the incident on her Instagram on Monday. She was immediately attacked with haters, who told her she was blaming the shark. However, she said she "love[s] sharks and I'm not throwing them under the bus." She said she knows the sharks did nothing wrong. “They are wild animals and it's an uncontrollable situation," she said, adding that the experience has been a "big learning lesson." She cautioned anyone thinking about swimming with sharks to know the risks. "I would recommend people to do it but be smart about it,” she said. “You are in their home."